I’m not ashamed to say that I’m typically a homebody on weekends. Some of my favorite activities include laying around in pajamas, marathon watching Netflix, and playing online poker from the comfort of my laptop (bonus points if I play while laying in bed/watching TV). I’m, like, incredibly good at powering through multiple seasons of hit shows in one sitting and I’ve really got my lounging perfected at this point, but I’ve gotta admit that I’m no professional poker player. James, on the other hand, is a pretty talented at Texas Hold’Em. And by that, I mean that he is good enough to have won a trip to Washington, DC with transportation, hotel, and breakfast for two included, as well as two awesome seats to the Devils @ Caps game and passes to meet the team afterwards. But for Valentine’s day, I’d honestly prefer to keep it stress-free and relax at home, so that’s exactly what James and I will be doing. If I’m feeling particularly romantic, there might even be candles and music. Probably not, but it could happen. 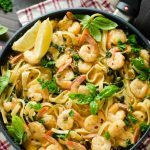 What there definitely will be is a good homemade meal and a lot of wine, so if you like to celebrate your V-day with flavorful food and a few glasses (or bottles) of vino like I do, you might be interested in this delicious dish. I have always been a huge fan Chicken Piccata, but when I decided to try stuffing spinach and ricotta inside, I really wasn’t sure how it’d turn out. 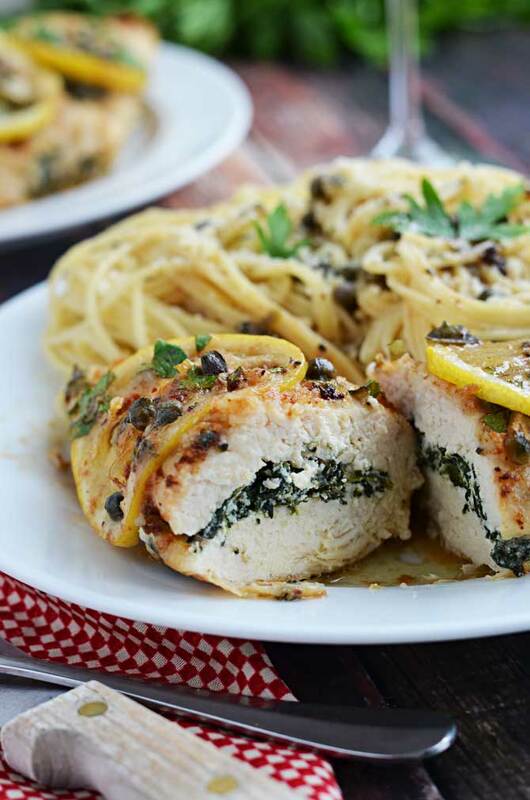 The flavors of the lemon, capers, wine, butter, ricotta, spinach, parsley, and chicken combined perfectly. 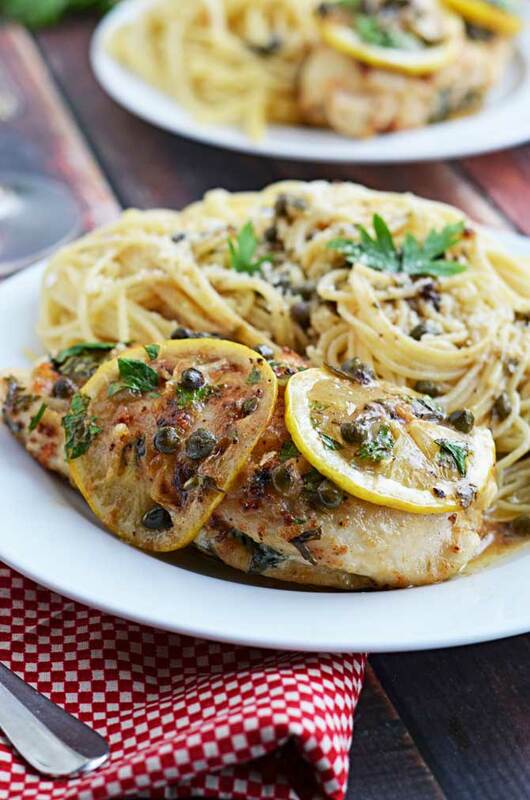 Served with pasta, the Stuffed Chicken Piccata could have passed for a restaurant meal. It’s one of those meals that makes you start hearing classic love songs in your head. WHEEEEEN THEEEE MOON HITS YOUR EYES LIKE A BIG PIZZA PIE, THAT’S AMORE! Cut the chicken breasts horizontally, carefully butterflying them open. 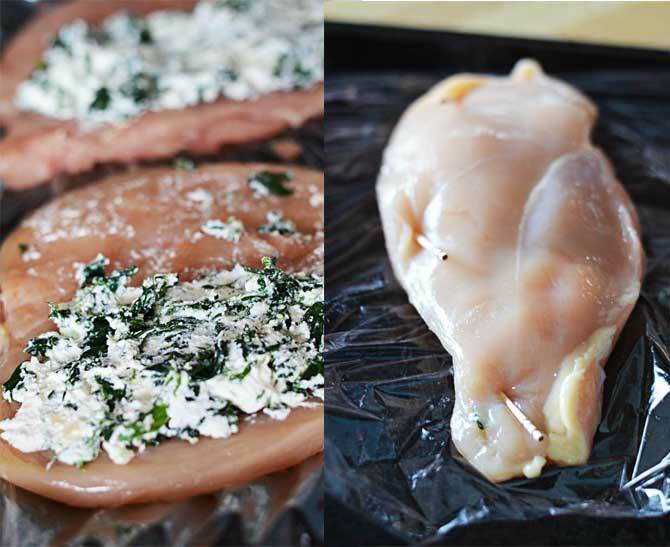 Place the butterflied breasts between two pieces of plastic wrap and pound them out to between ½ and ¼ inch thick. In a large skillet over medium heat, add in a drizzle of olive oil and the minced garlic. Saute the garlic for 2 minutes, and then slowly add the spinach, a bit at a time. Fill the pan with spinach leaves and continue to turn them over in the oil and garlic until they are wilted. Add more spinach to the pan and continue until the 4 cups has all been cooked. Remove the spinach from the heat and add in the ricotta, goat cheese, and a dash of salt and pepper. Spread this mixture over one side of the butterflied chicken breast, making sure not to spread too close to the edges. Fold the chicken over to cover the filling and seal with toothpicks. In a large, shallow bowl, mix together the flour, parmesan cheese, salt and pepper. Dredge the chicken breasts in the flour mixture until they’re coated. Preheat the oven to 350 degrees F. Prepare a baking dish with cooking spray. 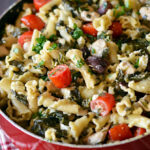 Heat the remaining olive oil and half of the butter in the same skillet you made the spinach in, over medium-high heat. When the butter and oil start bubbling, it is hot enough to add your chicken. Brown on each side until golden and then transfer the chicken to the baking dish. Top with a few slices of lemon. Bake for 10 minutes, or until chicken is cooked through and no longer pink. As the chicken bakes, prepare your sauce. 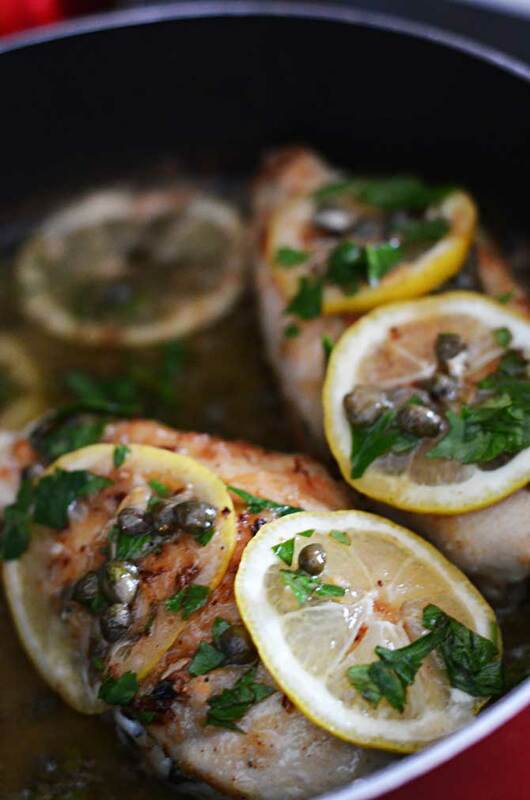 Add the white wine, lemon juice, and capers to the pan you cooked the chicken in. Using a spatula, scrape up the browned bits and mix them into the wine sauce. Reduce the sauce by half and then add the remaining bit of butter and extra lemon slices. Add the chicken back to the sauce, spooning the sauce over the chicken, and sprinkle generously with parsley. 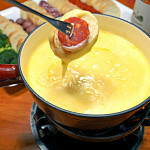 Serve with pasta or bread to soak up the sauce. 19 of our Favorite Valentine’s Day Recipes! 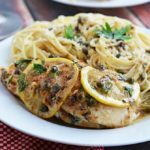 This chicken piccata is gorgeous! I am seriously in love! Thanks, Jocelyn! Hope you get the chance to give it a try sometime! Thanks for pointing that out, Theresa. I used 4 oz of goat cheese, but it’s not necessary to the recipe if you didn’t pick it up. I’ll go put that in now! Can you please tell me what you put on the pasta that accompanied your dish? 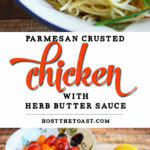 I took the pan sauce and poured it over the chicken and the pasta, and then added a sprinkle of parmesan and a bit more fresh parsley. I’m going to make this for a dinner party. 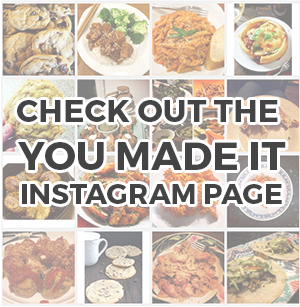 It seems like a whole stuffed chicken breast is a lot of food. Will this hold together if you slice it diagonally? That way, people can chose how much they wish to eat? ?